Cashflow 101, is an educational board game aimed at teaching investors concepts of accounting, finance and investing. 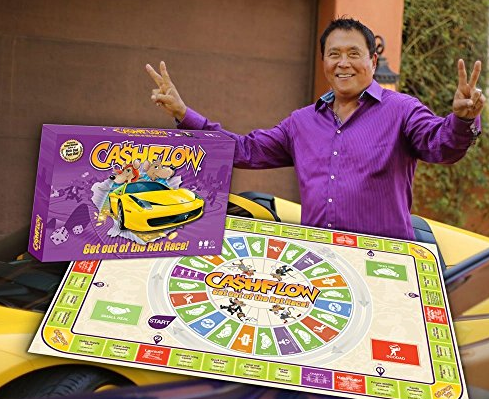 Cashflow 101, created by Rich Dad Poor Dad author Robert Kiyosaki, is an educational board game aimed at teaching investors concepts of accounting, finance and investing. Each person is given a profession card that defines their income, expenses, assets and liabilities. The objective of the game is to “get out of the rat race” by accumulating enough passive income that exceeds your expenses. This is accomplished by doing “Small Deals” (buying/selling stock, single family homes, land and starting small businesses) as well as “Big Deals” (buying multi-units, businesses and franchises). There are a lot of great things that can be learned by playing Cashflow 101. Here are just a few that I have found. Many people do not realize that there are various strategies for investing. The game provides a portion of the available strategies that allow people to start to realize how many different strategies there are, such as stock, mutual funds, bonds, real estate, small businesses and large businesses. Anyone that was investing in real estate around 2008 probably learned this first hand. After years of appreciation and property values going up, the bubble burst and property values fell a lot in some areas. The game shows changing markets and their impacts on the investing strategy that you are using. A lot of people think that being financially free means being rich. The game shows a different approach, which is financial freedom by having more passive income than expenses. The first time I played Cashflow I was disappointed that I was the teacher when others were doctors and lawyers. The light bulb moment I had that game was that I was able to get out of the rat race much faster than them because my expenses were much lower as the teacher. It is very important to understand how much risk you are comfortable with. As you play the game, you will be able to understand your personal risk tolerance and that of the people you play with. More than a Game - A Game Changer. Investing is a skill most can’t learn from a book. The alternative of learning in the ‘real world’ could prove costly. You need to first understand your own behavior. CASHFLOW 101 was created as a fun, powerful, and experiential way to teach investing and wealth building. Manage assets and liabilities, trade stocks and fight your way out of the Rat Race. When we play, that’s the truest example of our real life behavior. Think about your own behavior when they’re in the throws of competition. Do you get reckless when you’re winning or fall apart when you’re losing? Wouldn't it be better to learn these lessons on the gameboard than in the real world, with real money - your money. Come join us for some snacks and lots of fun! www.ReiaLV.com (Real Estate Investors Association of Las Vegas) does not give legal, tax, economic, or investment advice. Las Vegas REIA disclaims all liability for the action or inaction taken or not taken as a result of communications from or to its members, officers, directors, employees and contractors. Each person should consult their own counsel, accountant and other advisors as to legal, tax, economic, investment, and related matters concerning Real Estate and other investments. Copyright 2019 © Real Estate Investors Association of Las Vegas All rights reserved.